Below are the plus minus for the TCU game and for the season. I feel compelled to give the standard caveat for the plus-minus as a meaningful stat. It is a wonderful indicator stat but it is like recognizance from long-distance. It doesn't give you much detail, just a good indication of overall effectiveness. It does become more and more meaningful as you add games. Now 25 games in the season plus-minus is pretty indicative. Okay, having said all that, the numbers for Vick and Grimes have never been good and continue to be bad. In the TCU game Grimes played 36.0 minutes and had a terrible delta of -0.97. Now dleta is a relative measure. If does not say if the player played well or poorly, it only shows if the team performed better or worse with that player in the game or on the bench. Also, if a player plays very few minutes or many minutes, it becomes less meaningful. For instance, Dotson played all 45 minutes so it has no meaning for him since he was never on the bench. Agbaji played over 90% of the game so it is tough to make too much of it other than his was so high, it can't help but be indicative of serious value. But Grimes was so low that it can't help but give some indication that the team was considerably less effective with him on the floor. Everyone else was close to zero and pretty neutral. It is interesting to note that the Jayhawks were outscored with Agbaji on the bench. For the season Grimes and Vick are the team low with Grimes just a bit lower. Dotson is the clear team leader in delta meaning he is the most critical player to have on the floor since the team performance drops off when he goes to the bench. Garrett and D. Lawson are the other two that have good deltas. Offensively you can see it is pretty close but Garrett leads the team with Dotson just behind. But offensively we seem to be pretty consistent with all players. Defensively there is a bit of separation with Moore, Grimes and Vick. As for total plus-minus, Vick and Grimes bring up the rear with Moore next. 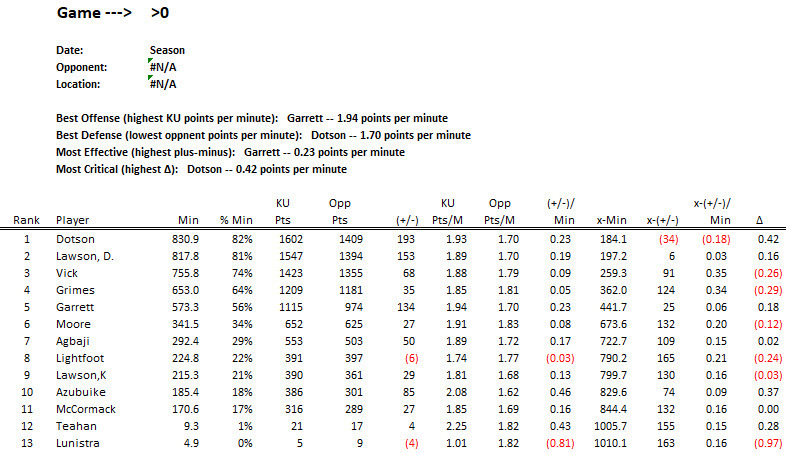 Dotson is the clear key with a +/- of 0.23 points per minute with Garrett right there with him. We outscore the opponents by 0.23 points per minute with those guys in the game. It is sad to say but Senex has made a case and the +/- backs it up. Grimes has not been effective at making this team significantly better. Vick is right there about the same level. For all the scoring and shooting hype Vick got, it did not really result in the team being any better overall. Obviously when Vick was in a zone he clearly made the team better on offense for those few streaky minutes but the price you paid was sort of a most of the time mediocrity or less for a few inconsistent and impossible to predict moments of greatness. Give me a consistent player anyday like Garrett. As or the TCU game, our choices were pretty limited. About the only person that I could see subbing for him effectively would be KJ. The cupboard is fairly bare right now. I do think that when Garrett comes back, I'd see him taking more of Grimes' minutes. In Grimes' defense, he is coming along, albeit slower than we'd like. If faced with a choice between Vick and Grimes, it comes down to a choice between a guy who has experience but doesn't show it, vs. a guy who is inexperienced and shows it. In that case, I'd play Grimes because Grimes has another 3 seasons to improve, whereas we've seen Vick plateau and I can't imagine that things will change much if/when he returns. Last Edit: 2 months 2 days ago by gorillahawk. ...making shots AND dishing assists...we need both...plus drawing fouls and plus ones...and he's a fast learner...he's a freshman starter on a once #1 ranked team! I'm really not trying to be snarky, but exactly how is Grimes "coming along?" Did you watch today's game? He was horrible. Not only does he miss his shots, they aren't even close. He actually tried to drive by a defender in the 2nd half, and simply couldn't generate the acceleration necessary, and ended up throwing the ball away. His Big 12 shooting stats are astonishing, and they are not getting better. His assist to turnover ratio is almost incomprehensible, and it is not improving. He's apparently incapable of getting fouled, and when that rarest of events occurs, he's shooting 50% from the line. He doesn't rebound, and his defense is mediocre. Again, where is his "coming along?" I truly wish that he would suddenly become a capable (not even top tier) rotation player, but when Garrett has a better shooting percentage from both 2 and 3, you are not deserving of playing for this team in any meaningful way. If Moore was not even worse, Grimes wouldn't see the floor once Garrett comes back from the ankle sprain. Agree. He made a couple of nice passes yesterday but that was it. When Garrett is healthy, soon I hope, he should start in place of Grimes. And KJ should sub in before Grimes as well. Coach has given Grimes every possible chance to show his stuff...maybe it's time to admit that, this year at least, he simply hasn't got the stuff.